2 deck. Easy. No redeal. 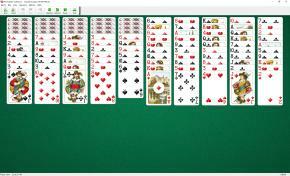 Double Scorpion Solitaire uses two decks (104 cards). You have 10 tableau piles. Four rows of 10 cards are dealt - the first 5 cards face down and the next 5 face up in each row. Then seven more rows cards are dealt, all face up. The last 11th row contains only four cards. To build 8 sequences down in suit within the tableau, each running from King to Ace. You may build tableau piles down in suit. Any face up card in a tableau can be moved to make a build. All the cards covering it are moved together as a unit. If, during play, any closed cards become the top card of a pile it turns face up. Empty tableaus may be filled with a King or group of cards headed by a King. 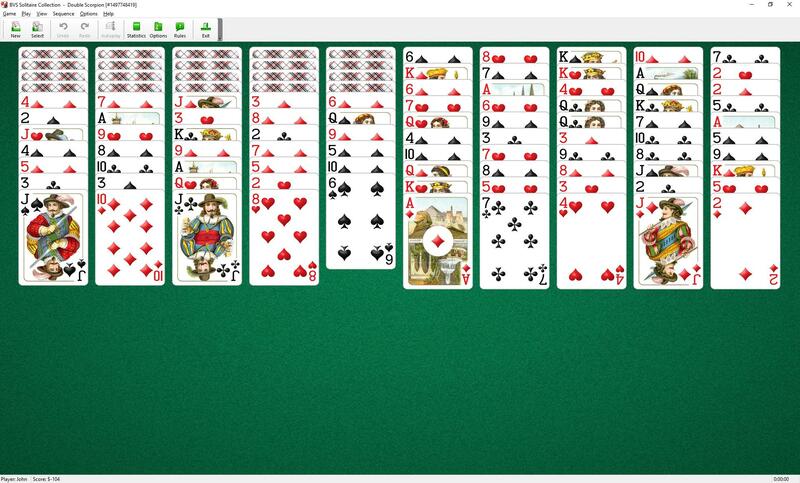 This game is a two-deck variation of Scorpion Solitaire. Beware of uncovering aces. No cards may be played on aces.